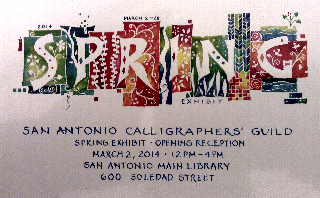 San Antonio Calligrapher's Guild (SACG) is having their Spring Exhibit at the San Antonio Main Library. The opening reception is Sunday, March 2 from 12- 4PM. The Exhibit will be on display through March 28. There are 39 works from different artists on display, two of which are mine. Both of my pieces are ink on paper so I'm really stepping outside my comfort zone. Come to think of it, I have been a member of SACG for a decade or so, entered a number of exhibits and these are my first pieces not on/in glass.